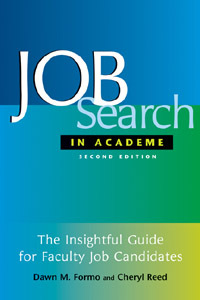 Review: Job Search in Academe. Formo, D.M. and C. Reed. (2011). Job Search in Academe. Sterling,Virginia: Stylus Publishing. Maybe I’m not the ideal reviewer of this book. The subtitle is this: How to get the position you deserve. I am not sure I would agree that this is ever true for anyone. Then again, I have always liked the line in the Rolling Stones song, “you can’t always get what you want, but if you try sometimes, you might find you get what you need”. I offered to review this book a short while back while I was preparing a session for the 2012 EDC conference in Halifax called “Networking for fun and profit: Build your own rainbow”, in which I shared some strategies for seeking the kinds of work, paid and otherwise, that interest you, be it to make a change, to keep a foot in the door upon retirement, to find work when your previous job is no more, or to find your first permanent job upon graduation. This book would be relevant to people who self-describe in any of those categories. Organized by a clever ‘showbiz’ metaphor, the chapters titles are, for example, Writing the Script (the application process), The Screen Test (the campus interview), The Awards Ceremony (negotiating the contract) and so on. The chapter titles did capture my interest, though I need to confess that when I was quite young, I thought the ideal job would be movie director. Many chapters are written by people in a variety of roles (including graduate students) speaking from their own personal experiences and/or starting with relevant quotes – a sort of mini case-study. In fact more detailed case studies are peppered through the book. Community colleges, universities, industry and some professions are represented and though it is mostly an American perspective, at least one author hails from the UK and another from Canada. Perhaps it is best to read this book not chapter by chapter, but by picking and choosing based on the stage you are at right now or the aspect of a job search that you are working on, such as your curriculum vitae, the application process etc., with an index to help you in that regard. You will find practical tips, sometimes in the form of bulleted lists. There are even some templates and examples included here and there. Will you learn a few things or a lot of things to help you start your search, hone your curriculum vitae, prepare for an interview, and, fingers crossed, negotiate for the things you want once you are offered a job? Yes! Might you lose interest in the whole prospect if you crack open the book and start reading from start to finish? Maybe. Then again, maybe that is just my perspective! Though I really liked the narrative aspect of many of the chapters, I often wanted to see more of a synthesis and found myself asking questions – is this story common or an outlier? What can I take from your experience to help me? Can we cut to the chase and see tips that are ‘tried and true’? Can you just give me a list of what to do and how to do it as best as I can to get the job I want and deserve? Oh yeah, life’s not always like that! Wishing you well in your job search in academe, whatever stage you are in, or reason for looking. My last sage piece of advice on the matter relates to a quote attributed to Albert Einstein: “Not everything that counts can be counted and not everything that can be counted counts.” In my EDC Rainbow session, we talked about “how you’ll know” a prospect might be right for you. Follow your head, or your heart? Sometimes it depends on a large variety of factors and circumstances – personal and financial most often. In my journey I discovered not always clearly what I wanted, but more often much more clearly what I did not want – I think that both are equally important. Visualize a typical day, and you making a particular choice. Does it feel right? Could it make you happy? Life’s short, my friends and Einstein was right. And, contrary to the book’s subtitle, you don’t always get what you deserve, but be confident that you have a lot of control over what makes you happy in life.